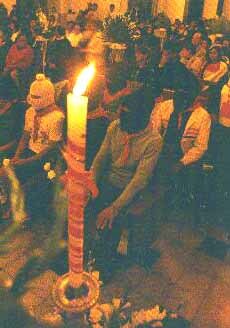 A NEW MODEL OF CHURCH IS SHAPED IN CHIAPAS - Unless we want a bad surprise – like the one the nobles had when the French Revolution started to kill them or the Russian bourgeois experienced when Communism tore down the old establishment – we should pay careful attention to what is being prepared by today’s groups that shape the future. What groups are these? Certainly it is not the mainstream center, which is nothing more than the cattle herd that always follows in slow speed the stimulus it received from the left. The future belongs to either the extreme left or the authentic right. The extreme left, because it is the forge where the Revolution melts the iron to shape it according to its new social and religious experiments. The authentic right, because from the ranks of those who react against the Revolution, Divine Providence often chooses the ones who will prepare the reality of tomorrow that will express original ways of giving glory to God. 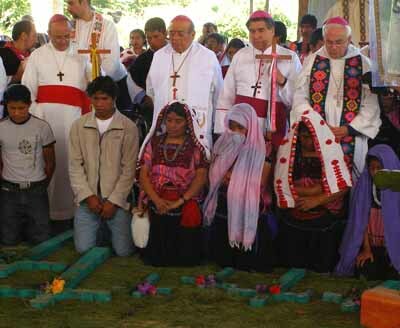 One of these leftist forges is Chiapas in Mexico, more precisely the Diocese of San Cristobal de las Casas, where Samuel Ruiz was Bishop for decades and established something quite different from a conventional Church. On January 25, 2010, Bishop Ruiz commemorated the 50th anniversary of his consecration as a Bishop. Gathering for the event were some 30,000 people who listened to talks that offer a general picture of the novel project under construction. Analyzing them, we can catch a glimpse of what is the so-called ‘Indian version’ of Liberation Theology, a model for the future. “The best way to pay homage to you is to consolidate and continue the Church you have inspired – which we cannot lose or allow to collapse or deviate from those fundamental options, the first being the preferential option for the poor. It is an option that is not just circumstantial or optional, but constitutes the very essence of the Church here and everywhere in the world. Unless one adopts this option he is not a Christian, not a member of the Church of Christ. “To be faithful to the Gospel of Jesus is to fundamentally serve the poor, even if this entails persecution and misunderstanding, as you have experienced. It is in the name of this fidelity to the Gospel that our Diocese confirms the effort to be the Church that you have dreamed of, inspired, nourished and promoted: a Church that is native, liberated, evangelical, servant, in communion and under the guidance of the Spirit. These are the six notes of the Church of Chiapa as established by the Third Diocesan Synod” (Adista-Documenti, March 6, 2010, p. 5). Examining the nub of this talk, we see that an exclusivist interpretation of what it is to be a member of the Church of Christ was clearly spelled out. Whoever does not take up the ‘preferential option for the poor’ following the Liberation Theology model is banned from the Church. It seems that this attitude is similar to the one that permitted Russian red guards to persecute and kill those who did not accept their soviet ideal. In today’s Brazil we are seeing this same “preferential option for the poor” used to invade and occupy rural properties and hand them over to the ‘landless’. Native – the Catholic Church ceases to be Roman and follow a Roman rite. It becomes a local Church and adopts Indian rituals in its life and liturgy. 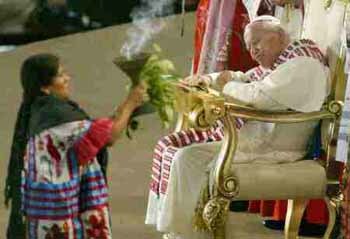 This was endorsed by John Paul II during Juan Diego’s canonization, for example. The introduction of Indian practices into the liturgy is also becoming increasingly frequent here in the U.S.
Liberated – this means to be free from Catholic teaching that encourages us to bear our sufferings patiently. Instead, the Church enters the political-social sphere to fight against “injustices” suffered by the poor and to “liberate” them from the “structures of sin,” which is a way of saying Capitalism. Evangelical – this Church would be without riches, property and majestic edifices and pomp. The Chiapas Church is a poor Church, one would say a proletarian Church. Servant – the Catholic Church should not impose her principles on the people or the temporal sphere, but be obedient to them. In the case of the Chiapas Church, it supposes that moral and dogmatic principles should adapt to the immediate needs of the people, rather than the opposite. In communion – nothing should be decided at the individual level, that is, by an established authority. The Church in permanent communion is a communist Church where every decision is taken by the entire community. Under the guidance of the Spirit – no authority is allowed to speak on behalf of God; all members can receive inspirations of the Spirit that have equal weight. It is a new version of the same old errors of the Shakers and Quakers who pretended to be guided directly by God. Again, it is a mystical pretext to install complete egalitarianism in Church teaching. Bishop Arizmendi also mentioned the Third Diocesan Synod, which was a regional council that lasted from 1995-1999 under the direction of Bishop Samuel Ruiz. 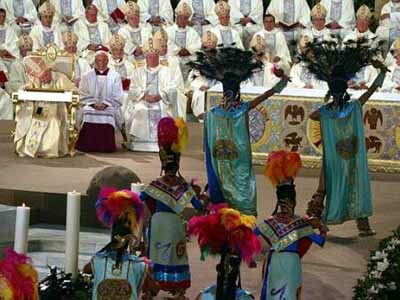 This Synod established all the needed ecclesiastical structures to foster the Native Church that took birth in Chiapas. Lopez stressed that Bishop Samuel Ruiz had assumed the true spirit of Vatican II to renew the ecclesiastical structures. Based on those conciliar teachings, his Diocese was fighting against the “structures of sin” and encouraging inculturation. Thus the Chiapas Church has become a paradigm for others because it is the house of God inculturated in its people. It is the incarnation of the Word, who set up his tent among the Indians to assume their historic and cultural reality. It has it own hierarchy that is part of the people, its own priests and its own ministry and institutions. These new emerging realities should be called Churches in the plural, Churches with diverse cultural identities, but united in the same faith. Based on these principles, the Indian Church should be a model for all the peoples, Lopez claims. It is time to end the “cloned Churches” shaped on the European model, and to raise up Native Churches, each one different and shaped by the culture of its own people. He finishes on a messianic note, pretending that by founding this Indian Church the Chiapas Church is re-opening the path of the first missionaries. According to Lopez, their original idea was not to develop a European model of the Church, but an Indian one. Bishop Samuel Ruiz took the podium to close the commemoration, emphasizing that “the spirit of Vatican II continues to inspire the long road of building the Native Churches where the values of the Gospel are incarnate in the culture” (Adista, March 6, 2010, pp. 5-8). With this, my reader has a notion of the perspectives of Liberation Theology that are already established in Mexico, Brazil and all of Latin America. This theology has been an important factor for the rise of socialist-communist governments in those countries. Unless Americans begin to pay more attention to this movement inspired and promoted by Progressivism, they may well see Liberation Theology take advantage of the more than 30 million Latino immigrants in this country. Motivated by these principles of social-political justice and led by proponents of Indian Theology, the “poor” are already claiming their “rights” to own much of the Southern United States, land that they pretend was unjustly usurped by Imperialist Americans. With this rhetoric of Indian theology, a strong political earthquake is being prepared to shake the American institutions.